There’s music in them there hills… and valleys. I have said it before and I’ll say it again; Wales produces an inordinate number of solid blues bands way above the ratio of virtually any other country. We can now add another one to that roster…The Liam Ward Band are a blues band from South Wales, and they mix their original blues with elements of jazz, rock and funk. Band leader, vocalist and harp player Liam Ward is a winner of the National Harmonica League Player of the Year and he is backed up by some of the cream of the Welsh blues scene: step up jazz guitarist Matt Jones (The Square Pegs, Django Chutney), Martin Hill on bass (Empty Pockets, Final Demand) and drummer Gareth Davies (Only Us, The Distributors). A glance at the other bands these guys are involved with tell of their skill and experience, as well as imaginative names…I think Django Chutney would go well with a chunk of Pwll Du; one of the finest Welsh cheeses available! 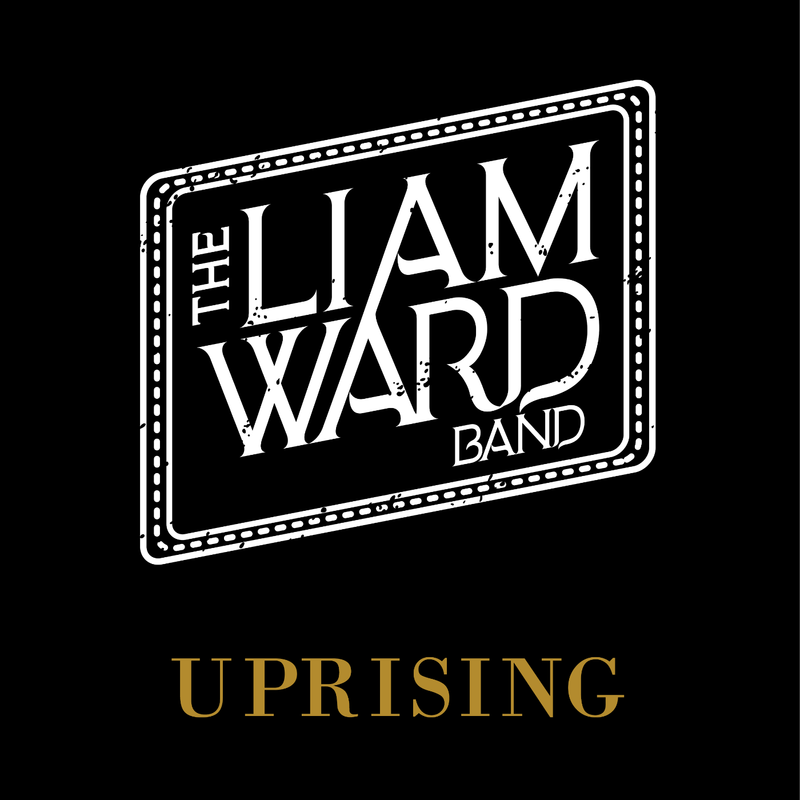 Uprising is their debut album in this form, and the all-original compositions bring to mind that master of the harp, Paul deLay sprinkled liberally with the chromatic harp style of William Clarke (try his ‘Blowin’ like Hell album if you like harp) and that’s just from Liam. Matt brings the jazz sensibilities and the fluidity of someone like Carlos Santana, while the bass and drum engine room conjures up the expansiveness and originality of Gerry McAvoy and Ted McKenna. Kicking of with What’s The Big Deal, we are straightaway into a blues standard structure as the guitar and harp play in perfect harmony and some horns back it all up. I must admit the harp solo is my kind of style as the subtlety of the instrument is illustrated by the careful, non-frantic phrasing and after a catchy duet with Matt we get a superb solo with feel. I’m Gonna Fly has a bass tom drum intro and clever guitar, as the harp expands the melody. That catchy rhythm backs the whole song letting the harp punctuate at will without histrionics. No Delay starts with some weighty bass guitar notes before the whole band join in with a staccato riff…the guitar sound is hard to define (semi-acoustic?) but it conjures up the fine work of Ray Fenwick when I hear the fret work. This is a great song with a tint of funk, a tinge of soul and a whole lot of blues working together. Gina is up next and gives an example of how to make simple sound clever…it has a R’n’B feel as Matt plays some great chorded guitar and Martin puts in a great bass line and, at the bridge, the tempo changes with some blues guitar phrases thrown around the vocal before the pace returns and a harp solo with loads of expression and techniques works well too. Wild Places moves us into true blues and a guitar sound that is just right…you know, when the strings talk eloquently and the bends and runs inject the emotion. Granted the vocals could have been a bit edgier and raw to match the blues in the story, but that is forgotten because of that guitar…and the solo is even better! No surprises then when I say this is my favourite by a long way and more than satisfies my need for blues and my inner geek is totally sated with the guitar playing. The Insidious Kind has a Santana(ish) feel to the way the instrumental melody lilts in direct contrast to the rather dark lyrics of sinister, devious and dangerous characters that, unfortunately, do exist. This is a clever and complex tune with every band member totally synchronized. Filthy Rich is a slow paced rocking kind of blues and the harp intro and solo is inspired. A guitar solo of mainly chords is clever and effective too. Hack Hack Hack changes the tone with a more jazz based rhythmic feel and as the gentle snare rim taps take us through the verses until the snare takes up a complicated sequence behind yet another quality piece of guitar; the harp solo is as talkative as the lyrics…neat! Use It Or Lose It could be Madness in its simplistic and swinging beginning before the chorus takes us almost into theater and the central section speeds up into a TV theme sound…a bit of a mix that is entertaining enough but seems to me to jar a little with the rest of the content. The title track, Uprising, closes the album and brings us back to jazz based rhythms and more harp that seems to tell a story without words on this instrumental. The guitar, bass and drums are subtle in the backing but concentrate on each one independently and you will hear how good these guys are. I thoroughly enjoyed this album…even the Inspector Gadget detour…and the musicianship is beyond reproach. It may not be for the true blue purists but with the jazzy phrasing from Matt, the great bass and drums and the subtle instead of screaming harp from Liam makes this a worthwhile addition to most people’s collection. Give it a listen…try Wild Places first and you will soon agree. Full details other musicians available in the liner notes. Recorded at Sonic One Studios and mastered at Abbey Road Studios in London.